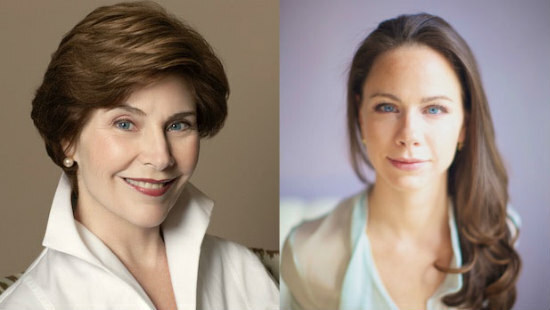 Former First Lady Laura Bush and her daughter, Barbara Pierce Bush, will be the featured speakers at the 2019 event. A new group of extraordinary women, past and present, who have made their mark on the greater Kansas City community have been named to the Starr Women’s Hall of Fame. The Hall of Fame was created to honor women who have made Kansas City a better place to live, work and serve, said Carol Hallquist, co-chair of the Hall of Fame planning committee. “These women make up the third class of honorees since the Hall of Fame was formed. They are remarkable women whose stories and examples will inspire women to reach ever higher for generations to come,” Hallquist said. The 10 outstanding women in the 2019 class of honorees will be honored at a gala event at 11:30 a.m. March 22, 2019, in Swinney Recreation Center on the University of Missouri-Kansas City campus. Former First Lady Laura Bush will be the featured speaker at the event and her daughter, Barbara Pierce Bush, will be interviewing her at the event; tickets are available at www.umkc.edu/starrhalloffame. · Lois Ellen (Bunni) Copaken, founding board member of the Kansas City Friends of Alvin Ailey, founding member of the Women’s Foundation and past president of the Junior League of Kansas City, Missouri. · Mary Tiera Farrow (deceased), founder of the first organization to welcome women in the legal field in Kansas City, first female judge in the City of Kansas City, first woman in the U.S. to defend a woman on trial for murder and first woman to argue before the Kansas Supreme Court. · Laura Rollins Hockaday (deceased), longtime society editor for The Kansas City Star. She transformed race relations by redefining “society” and by expanding the newspaper’s previously racially restrictive society page to be inclusive of all people in the community. · Mamie Currie Hughes, advocate for scores of projects aimed at cutting through racial and gender biases and discrimination, charter member of the Jackson County Legislature, former Chair for the Mid-America Regional Council and founding member of the Central Exchange. · Patricia McIlrath (deceased), longtime chair of the Department of Theatre at UMKC, founder of the Missouri Repertory Theatre (now KC Rep) and progenitor of Kansas City’s status as one of the top five professional theatre cities in the U.S.
· Janet Murguia, president and CEO of Unidos U.S. (formerly National Council of La Raza); longtime national civil rights advocate, especially for Hispanics; and former Deputy Assistant to President Clinton. · Mona Lea Perry, tireless advocate for Native Americans, one of Kansas City’s Wisdom Keepers and recipient of four certificates of service as a member of the Missouri Advisory Committee for the U.S. Commission on Civil Rights. · Nell Quinlan (Donnelly) Reed (deceased), dress designer and manufacturer of the Nelly Don brand. Her Donnelly Garment Co. was the largest dress manufacturing company in the world during much of the 20th century. She was a pioneer in employees’ rights and implemented many improvements in employee work conditions and compensation. · Beth K. Smith (deceased), co-founder of the Central Exchange and Women’s Employment Network, chair of the Mayor’s Commission on Human Relations for Kansas City, Missouri and member of numerous national and local nonprofit boards. · Linda Hood Talbott, founder of the Center for Philanthropic Leadership and founding member of the Greater Kansas City Foundation, Women’s Employment Network, Central Exchange and Women’s Foundation. She was recognized by three U.S. presidents for her leadership in helping the elderly, youth and women of America. The Starr Women’s Hall of Fame is dedicated to recognizing extraordinary Kansas City women and preserving the history of their accomplishments. These women are social reformers, volunteers, philanthropists, civic leaders, activists and educators. They are neighborhood leaders and grassroots organizers, from yesterday and today, both famous and unsung. They are movers and shakers whose tireless commitment to community has made Kansas City a better place to live. The Hall of Fame is a repository for their legacies. By sharing their stories, the Hall of Fame encourages and inspires women everywhere. Biographies of all of the previous honorees are available at https://www.umkc.edu/starrhalloffame/hall.cfm. The Hall of Fame is named in honor of Martha Jane Phillips Starr, a legendary activist and philanthropist who blazed a trail for family issues and women’s rights. The Hall of Fame is made possible through the Starr Education Committee, Martha Jane Starr’s family and the Starr Field of Interest Fund, which was established upon her death through the Greater Kansas City Community Foundation. The idea for the Starr Women’s Hall of Fame stemmed from Starr Education Committee members. A permanent display honoring Hall of Fame members is now open to the public on the third floor of the Miller Nichols Library at the University of Missouri-Kansas City. The library is at 800 E. 51 St., Kansas City, Missouri. The civic organizations that advocate on behalf of women and family issues and have signed on in support of the Starr Women’s Hall of Fame include: American Association of University Women, American Business Women’s Association, Central Exchange, CBIZ Women’s Advantage, Girl Scouts of NE Kansas and NW Missouri, Greater Kansas City Chamber’s Executive Women’s Leadership Council, Greater Kansas City Women’s Political Caucus, Jackson County Missouri Chapter of the Links, Inc.; Junior League of Kansas City, Missouri; KC Metro Latinas, Kansas City Athenaeum, Kansas City Young Matrons, Women Leaders in College Sports, OneKC for Women, SkillBuilders Fund, Soroptimist International of Kansas City, Soroptimist Kansas City Foundation, UMKC, UMKC Women’s Center, UMKC Women’s Council, UMKC Women of Color Leadership Conference, WIN for KC, win|win, Women’s Foundation, Women’s Public Service Network, Zonta International District 7 and Zonta Club of KC II. Tags: Laura Bush, Starr Women's Hall of Farme.